I've learned a number of lessons over the course of my life, but some of them I need to occasionally re-learn. Just recently I had to re-learn the hard way to "look before you leap." Or, don't rush ahead of the Lord when making plans. A couple friends were leaving my house after book club about a month ago, discussing an upcoming trip they were planning. "Hey, you wanna come?" they asked. Yeah right, I thought. I'm getting ready to go to Hawaii, and they were talking about a major trip planned for the beginning of December. It would require considerable preparation and would be pricey, too. Plus, I had never considered such a trip, halfway across the world to a mysterious and exotic location. "I'll pray about it," I told them, without much conviction. Well, that's the problem. I didn't really pray about it. I kind of forgot about it. But when I got home from Hawaii, I somehow allowed myself to get caught up in the excitement of the plans, hurried along by pressing deadlines. Before I knew it, I was researching getting a tourist visa, checking into getting vaccinations, making packing lists, and purchasing an expensive airline ticket. Several times, the thought went through my head: am I supposed to be going? Is this really a good idea? Even, I'm not so sure this is a good idea. The other travelers had definite plans and reasons for going (this wasn't just a vacation, in other words); I was just kind of tagging along. Several family members and friends cautioned me against going; I was facing dealing with the high probability of running into deadly allergens (I have an anaphylactic reaction to sesame) that I may not have been able to avoid because of the ubiquitous use of sesame there and problems of communicating in another language with food vendors and restaurant workers. However, I was prepared to take along protein bars and other food just to avoid any issues. But then there were other safety issues as well. Honestly, I think I would have been fine, but as I weighed these risks against whether or not I had a calling to go, I realized I couldn't expect God's protection if I had no clear call to go, and if I was running ahead of His purposes for me. And what if His plans there didn't include me for some reason? Somewhat abashed, I cancelled my flight and reluctantly told my friends. I don't think I'll ever know for sure why I had that check in my spirit, but I think it's always right to Pay Attention. Now, here's someone who suffers no nagging and bothersome existential questions about whether or not to go for it. He just plows ahead, regardless of the consequences. I had filled my feeder up, and had a little more seed left in the bag, so I just sprinkled it all along a section of my deck railing, hoping my little bird friends would enjoy the extra treats. But here comes Mr. Squirrel, the scourge of the neighborhood. He starts at one end, and proceeds, single-handedly, to eat up every single seed in sight. Wow. He's not going to be feeling well later. What about you? Have you charged ahead, making plans, and then realized you had been too impulsive? Or not spent time praying about it? Good for you that you listened to your intuitive self, Deborah. What an honest and insightful post. Wise you listened to the caution about the proposed trip. God uses all kinds of ways to get our attention. And we have to keep relearning lessons, don't we? I'm impressed with your brave feat in Hawaii! I do it ALL the time. In fact I was supposed to go to Mexico with a friend and decided against it. Something told me it just didn't feel right. I have done this too many times...made elaborate plans and realized too late I should not have. This always results in me being frustrated and a bit resentful , and it's all my own fault. Good reminder, thank-you. 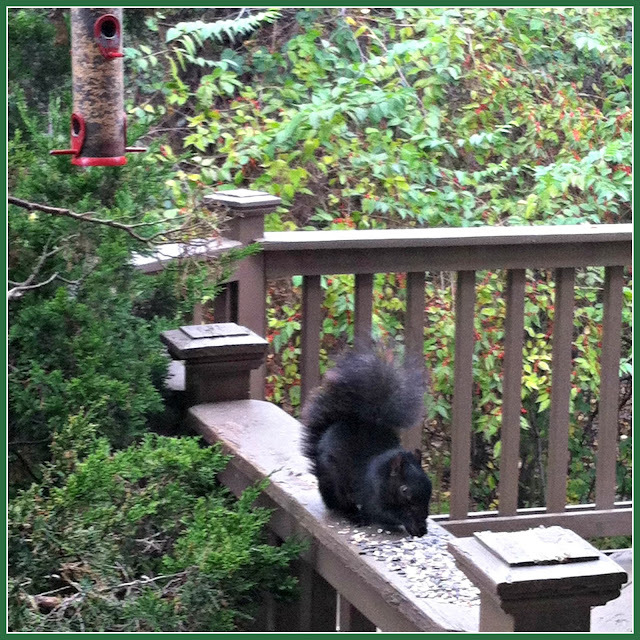 What a beautiful squirrel, I echo Rue , I've never seen a black squirrel before either. Oh yes Deborah I have done this several times and had to relearn this lesson too. The good news is, you rethought your actions before it was too late. That's God's work in your heart. This rings true for most people, I would imagine. Glad you listened to that still small voice. Squirrels are a big pet peeve of mine. Cute, but I don't like them. Greedy doesn't begin to describe them. Yes, this has happened a few times to me. And I will tell you that you stopped and said no, and it was probably a very wise choice. Maybe one day you will see the wisdom in the choice you made to not go! You say you weren't listening, but I think you really were. It just took you a while to heed what you already knew in your heart. You probably feel like a worrisome weight has been lifted now. Have a wonderful weekend, and don't forget to buy another bag of bird/squirrel seed ;) Our squirrels (so many!) are sleek and plump too, but I usually throw seeds on the ground under the birdfeeder just to keep the squirrels on the ground rather than gobbling everything up everything in the birdfeeder! Glad you did rethink this and prayed about it thoroughly. Hope you had not actually booked your tickets yet as it is not easy to get your money back; unless you took an expensive insurance for doing so. We have pondered about certain trips and weighed the cost and all and decided no we're not supposed to be doing this! There always comes a time when things work out just fine and also for safety and all included. Oh Bless your heart, Deborah! Yes, I've run ahead of God, regretted it every time...in time. Now I'm better at waiting...wait is a verb, doncha know? The folks who wanted/want to buy my farm had a change of plans and aren't able now. Perhaps in the spring...March. Perhaps. Now, it's a time of waiting, of finding joy in the here and now and knowing I'd rather have God's perfect will rather than His permissive will. When you find time, read today's Sabbath Keeping post; it's on the Holy Spirit and might help you. I think you were very wise in trusting your intuition, Deborah. What a good lesson to learn, that we must pray first, before making decisions. Hi Deborah, I think your new hairstyle is very becoming on you, even my hubby agrees. Growing out your hair is love/hate relationship with hair. Just keep doing what you're doing and you'll be fine. PATIENCE IS THE KEY. Took me a long while and tons of hair cuts, but I've been white now for 12 years and wouldn't change it. The blue dress will look stunning on you. Hang in there Deb. Keep smiling because you are beautiful and you do matter in the world.